While they may be furry, hamsters do not do well in cold temperatures. Even hot temperatures can be deadly for your hamster. 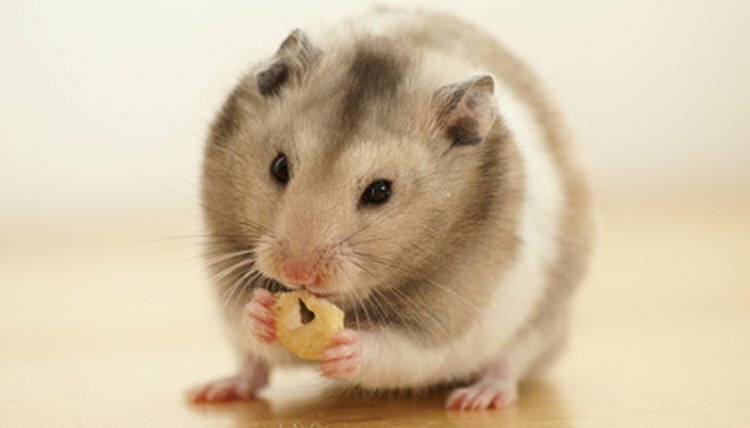 Like reptiles and fish, hamsters require a set temperature range to ensure they stay healthy. The wrong temperature can lead to colds that cause fatal conditions or to heatstroke. As a responsible pet owner, do what's necessary to keep your hamster at a comfortable temperature. Keep hamsters at 65 to 75 degrees Fahrenheit. Most varieties of hamsters come from desert climates and burrow during the day to avoid the heat. Their origination from the desert means that they cannot withstand cold temperatures. This is not something to overlook. Housing your hamster at an improper temperature can be deadly. That doesn't mean the temperature must stay at one temperature. Turn down your thermostat at night, if you like. Just stick within the safe zone. Temperatures below 65 degrees Fahrenheit chill your hamster, causing colds and false hibernation. Colds are much more serious in hamsters than humans, often quickly developing into pneumonia. If your hamster hibernates, especially if he's older, a chance exists he won't wake up. Hibernation slows the heart to a state of rest; older hamsters usually cannot handle this, and the heart stops completely. While temperatures slightly over 75 degrees Fahrenheit are not as potentially deadly as temperatures below 65, warmth over 80 degrees Fahrenheit can cause heatstroke. Only immediate attention will save the hamster's life. Keep your thermostat between 65 degrees and 75 degrees Fahrenheit year-round. Provide ample bedding to keep your pet warm and place the cage in and area that is free from drafts. You never want to place the cage next to a window, because the hamster can get too hot. Never keep your air conditioner set below the hamster's appropriate temperature range. Even in the summer, your hamster can develop a cold Never place a frozen water bottle in the hamster's cage, and don't let your hamster get wet, which can cause him to get chilled and sick. Some hamster breeds, such as winter whites, are an exception to the rule. The winter white originates from colder climates and has an appropriate temperature range of 65 degrees to 70 degrees Fahrenheit. Always research your variety of hamster so that you provide the best care possible.